This program is delivered in Bioforce Institut, Vénissieux (69). The MSc in Humanitarian Programme Management aims at training managers for the humanitarian and development sector (NGO, non-profit or charitable organisations, foundations, etc.). It leads to a variety of positions in the area of humanitarian operations, implying coordination and management. Entry positions can be found as Reporting Officer, MEAL Officer (in charge of Monitoring, Evaluation and Learning), Coordinator or Programme Assistant or Grant Manager for more junior profiles. Middle management positions include Project Officer, Programme Manager, and Field Officer. And the highest positions are Programme Coordinator, Head of mission or Country Director, according to the specifics of each organisation. A Humanitarian Programme can be defined as a set of activities planned and undertaken by an Aid organisation, directly or by mean of partnerships with other organisations, in a specific geographical area, over a specific timespan, in pursuit of specific objectives to address identified humanitarian needs. To undertake the activities (often organised in a set of related projects), human, material and financial resources are required, as is the analysis of the programme’s environment and surrounding actors. Management in such contexts implies the use of organisational and methodological tools and techniques to assess, plan, organise, monitor and report on both the programme’s activities and the optimal use of assigned material and financial resources. It also implies team support (through motivation and development) and the creation and maintenance of relationships and dynamics with a variety of stakeholders, to ensure the achievement of results in a challenging and changing environment. Many Aid organisations face the challenge of recruiting and retaining skilled managers in order to ensure continuous, consistent and effective management of their programmes. This training programme has been developed to answer both organisation and individual needs: to empower potential and current humanitarian managers to develop their technical, analytical and personal skills. 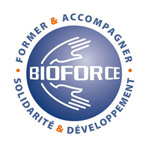 The partnership between Bioforce and Grenoble Ecole de Management has enabled the creation of a substantial management training programme for the humanitarian and development sector, offering trainees the academic qualification and specific expertise they seek. This academic expertise is completed by a strong involvement of professionals from the humanitarian and development sector in the training delivery. Introduction to the training's objectives, contents and organisation to participants. To ensure that the expectations of trainees are coherent with the learning objectives defined for the programme. Develop group dynamics among learners by involving them in joint activities, and in synergy with Bioforce staff. This full-scale, outdoor exercise involves a large group of students, providing the MSc in HPM students with the opportunity to collaborate with Logistics, Human Resource and Finance students. Within an operational framework, they will have to put into practice the various capabilities developed throughout the training period. Note: For GEM students, it is possible to follow the "English track programme" described below or to spend the second semester in an English-speaking university abroad. External students of the MSc must follow the "English track programme" delivered in Grenoble. Quantitative modelling and simulation tools to help in decision-making. Strategic choices that the manager must operate in an entrepreneurship environment (opportunity, business model design) ; Different options for development and growth patterns (internal / external growth, mergers and acquisitions, alliances). This module seeks to move beyond simple 'managerialistic' views by integrating recent developments in organisational thinking with the dual challenges of organisational leadership and corporate social responsibility. The course will be demanding in terms of class preparation, contribution and after-class work, and hopefully rewarding in terms of generating novel insights into contemporary organisational and managerial challenges. Institutionalised environments, innovation and entrepreneurship, social movements, networks and social capital, power and politics in contemporary organisations, organisational routines and decision making, sense making and cognition in organisation and organisational change. Each topic will be introduced through case studies alongside theoretical readings, and each of the course session will discuss the consequences of these topics for both leadership processes and corporate social responsibility. Inductive approach incorporating discovery learning, experimentation and interrogation. Learning by doing with exercises and case studies related to NGO management practices. Concepts and behavioural understanding through role-playing. Introduction of analysis grids and tools adaptable to different contexts. The maximum number of participants for this training programme session is 20. The Bioforce Institute and Grenoble Ecole de Management reserve the right to cancel the training programme in case of an insufficient number of participants (in which case, the persons registered will be fully reimbursed). To work as a team during the whole training period to sort out a humanitarian and/or development management issue. Students are invited to investigate a pressing issue or a topic that is subject to debate in the humanitarian and development sector. This applied research has to translate into a written report in English and an oral presentation in front of a jury composed by the tutor and the partner Bioforce Institute. A written report in English (20,000 – 25,000 words) which may remain confidential (it is possible to write a summary for the organisation in a foreign language if required). Students have to submit the final report to the tutor 2 weeks before the oral presentation. The deadline for the oral presentation to take place is mid-November. The definition of the issue to be researched has to be validated by both Bioforce and GEM. A specific schedule with deadlines will be communicated by Bioforce. Rigor in diagnostic, analysis and facts interpretations, as well as recommendations will be required. This work aims to support humanitarian organisations in their development and functioning. In this way, we expect students to be creative (while being realist) and to practice benchmarks. This research work is neither an operational mission nor a counseling one. The report presented is not an internship report either. Usually, GEM students have to write a “Grand mémoire” during their enrollment. The MSc’s applied research report exempts them from the “Grand mémoire”. An individual written exam for the “Framework of Humanitarian Aid” module. An individual written exam for the “Managing people and organizations” module. An individual written exam for the “Managing programmes and projects” module. An individual written exam for the “Managing finance and funding” module. For each module, a continuous assessment is managed by a Grenoble Ecole de Management’s permanent professor. For some modules, an exam is organized. To be successfully completed, the student has to obtain a minimum of 10 out of 20. Each module’s responsible define the share of continuous assessment and exam. Having produced and presented orally two reports demonstrating analytical and deductive skills (one related to the Applied Research project and the other related to the assignment/internship). To reinforce students’ autonomy and to further develop their skills as humanitarian programme managers in the humanitarian and development sector. Students have to do an internship, after their study period, for 20 weeks at least (for instance in an NGO). The presentation of the report corresponding to this internship, to a board of examiners, must be done before mid-November 2019. The assignment terms of reference are to be submitted to Bioforce in order to be validated. As a second step, GEM will give the final validation. GEM is in charge of all administrative issues regarding the assignment. The final mark will be a global mark including the written report and the oral presentation. By special dispensation, a L3 (licence) level or Bachelor’s degree (three years of higher education after baccalauréat) for applicants justifying an outstanding work experience (more than one year). have an English language proficiency level of B2 (according to European language levels - Self Assessment Grid).